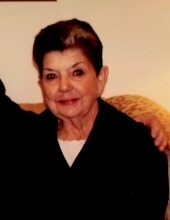 Patsy Molnar, 79, of Diana passed away Sunday March 10, 2019 in Longview, Texas. Arrangements will be held at a later date and are under the direction of Grubbs-Loyd Funeral Home in Diana. Patsy was born November 13, 1939 in Diana, Texas to Chessie Dewie East and Jessie Ward East. Patsy was retired from a career in accounting and enjoyed cross-stitch, gardening and feeding her birds. Patsy is survived by her son, Bela Molnar Jr. and wife Virginia, brothers; Dewey East and wife Doris, Melvin East and wife Karen, grandchildren Samantha Molnar-White, Isabella Molnar and Matthew Molnar, great-grandchild Natalie Molnar-White. She was preceded in death by her parents, husband Bela Molnar Sr. and sister Norma Jean East. Lieu of flowers the family asks that you make a donation to St. Jude Children's Research Hospital. To send flowers or a remembrance gift to the family of Patsy Molnar, please visit our Tribute Store. "Email Address" would like to share the life celebration of Patsy Molnar. Click on the "link" to go to share a favorite memory or leave a condolence message for the family.